MOTHER 2 is set to be released on the Japanese Wii U Virtual Console in about 24 hours from the time of this post. In preparation, Shigesato Itoi has posted a video and began posting an interview between him and Satoru Iwata. Thank you for all for visiting Hobonichi. MOTHER 2 has finally been revived. People were always asking, “Is it going to come out? Is it going to come out?” Now, the chance for you all to play it again has finally arrived. Being such a hands-off, nitpicky sort of parent to the game it’s hard to say much about whether you’ll like it or not, but I think you will. Please ask people who’ve played it before. If you hear that it’s boring, though, then I guess it can’t be helped. I’m going to play for a while too, so please play along with me. Thank you. 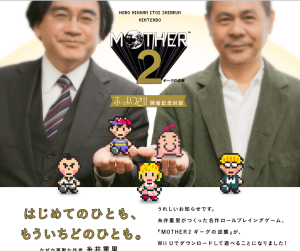 On top of that, a multi-part interview between Itoi and Iwata has begun to be posted online here. Only the first part is up right now, and it in it the main point of interest is something I’ve touched on a few times in the past. Basically, MOTHER 2 was taking too long to develop and was getting close to cancellation. Satoru Iwata showed up to fix things and said, “Hey, as things are now it’ll take us two years to finish this game. But if we restart from scratch I can get it done in 6 months.” And that was how Itoi and Iwata met. I don’t have time to translate the article, but that’s essentially the gist of what the first part of the interview is about. Tomorrow I hope to dive into the Japanese Wii U version of MOTHER 2. If there are any content changes I’ll of course post them ASAP. For reference, if there ARE any content changes in MOTHER 2, I’m only expecting two changes, as outlined here. Of course, since this is the Japanese release, it’s anyone’s guess as to what’s been done to it, if anything. Anyway, I’ll keep updating with stuff as stuff happens! This is all so exciting! Once again, thanks for translating all of this information. It’s going to be interesting for him to do a play through because he can post screen shots and comment on them. I wonder if other developers or musicians from the series will appear in the miiverse community as well? This is so cool. When and if this does get released here, it sure would be nice to hear Itoi make a comment or two before releasing it to us. I’m really curious to see if any changes are made. If there are any maybe that will help our chances of getting a rerelease. I see it this way, if they made those three little changes, then its going to be released here, if thy didnt, then its not. Lets hope for the first. Nice, thanks! I’m eager to know if there are any content changes as well. Flint: The Japanese version would only need two changes, since the Dali’s Clock isn’t called by that name in the Japanese version anyway. I honestly would love it if they just replaced the Sky Runner music with the Mother 3 flying fridge song.